This is an old revision of this page, as edited by BattyBot (talk | contribs) at 02:22, 20 November 2016 (General fixes & manual clean up, replaced: turkey using AWB). The present address (URL) is a permanent link to this revision, which may differ significantly from the current revision. Not to be confused with Lombardi. Template:Infobox Region of Italy Lombardy (/ˈlɒmbərdi/ LOM-bər-dee; Italian: Lombardia [lombarˈdiːa]; Lombard: Lombardia, pronounced: (Western Lombard) [lumbarˈdiːa], (Eastern Lombard) [lombarˈdeːa]) is one of the twenty administrative regions of Italy, in the northwest of the country, with an area of 23,844 square kilometres (9,206 sq mi). About 10 million people, forming one-sixth of Italy's population, live in Lombardy and about a fifth of Italy's GDP is produced in the region, making it the most populous and richest region in the country and one of the richest regions in Europe. Milan, Lombardy's capital, is the second-largest city and the largest metropolitan area in Italy. The word Lombardy comes from Lombard, which in turn is derived from Late Latin Longobardus, Langobardus (“a Lombard”), derived from the Proto-Germanic elements *langaz + *bardaz; equivalent to long beard. Some sources derive the second element instead from Proto-Germanic *bardǭ, *barduz (“axe”), related to German Barte (“axe”). "Lombardy" referred during the early Middle Ages to the entire territory of Italy (known as Longobardia Major and Langobardia Minor) ruled by the Lombards, a Germanic tribe who conquered much of the Italian peninsula beginning in the 6th century. During the late Middle Ages, the term shifted meaning and was used to identify the whole of Northern Italy. With a surface of 23,861 km2 (9,213 sq mi), Lombardy is the 4th largest region of Italy. It is bordered by Switzerland (north: Canton Ticino and Canton Graubünden) and by the Italian regions of Trentino-Alto Adige/Südtirol and Veneto (east), Emilia-Romagna (south), and Piedmont (west). Three distinct natural zones can be fairly easily distinguished in the Lombardy region: mountains, hills and plains – the latter being divided in Alta (high plains) and Bassa (low plains). The orography of Lombardy is characterised by the presence of three distinct belts: a northern mountainous belt constituited by the Alpin reliefs, a central piedmont area of mostly pebbly soils of alluviional origin, and the Lombard section of the Padan plain in the southernmost part of the region. The mighty Po river marks the southern border of the region for a length of about 210 km. In its progress it receives the waters of the Ticino, which rises in the Bedretto valley (Switzerland) and joins the Po near Pavia. The other streams which contribute to the great river are, the Olona, the Lambro, the Adda, the Oglio and the Mincio. The area of current Lombardy was settled at least since the 2nd millennium BC, as shown by the archaeological findings of ceramics, arrows, axes and carved stones. Well-preserved rock drawings left by ancient Camuni in the Valcamonica depicting animals, people and symbols were made over a time period of eight thousand years preceding the Iron Age. and 300,000. After the initial struggles, relationships between the Lombard people and the Latin-speaking people improved. In the end, the Lombard language and culture assimilated with the Latin culture, leaving evidence in many names, the legal code and laws, and other things. The end of Lombard rule came in 774, when the Frankish king Charlemagne conquered Pavia, deposed Desiderius, the last Lombard king, and annexed the Kingdom of Italy (mostly northern and central Italy) to his empire. The former Lombard dukes and nobles were replaced by other German vassals, prince-bishops or marquises. In the 15th century the Duchy of Milan was a major political, economical and military force at the European level. Milan and Mantua became two centres of the Renaissance whose culture, with men such as Leonardo da Vinci and Mantegna, and works of art were highly regarded (for example, Leonardo da Vinci's The Last Supper). The enterprising class of the communes extended its trade and banking activities well into northern Europe: "Lombard" designated the merchant or banker coming from northern Italy (see, for instance, Lombard Street in London). The name "Lombardy" came to designate the whole of Northern Italy until the 15th century and sometimes later. From the 14th century onwards, the instability created by the unceasing internal and external struggles ended in the creation of noble seignories, the most significant of which were those of the Viscontis (later Sforzas) in Milan and of the Gonzagas in Mantua. This richness, however, attracted the now more organized armies of national powers such as France and Austria, which waged a lengthy battle for Lombardy in the late 15th-early 16th century. The Milan 1906 world's fair. Lombardy industrialised early and since the late 1800s has remained Italy's industrial powerhouse. The growth of the regional population was particularly sustained during the 1950s–60s, thanks to a prolonged economic boom, high birth rates, and strong migration inflows (especially from Southern Italy). Since the 1980s, Lombardy has become the destination of a large number of international migrants, insomuch that today more than a quarter of all foreign-born residents in Italy lives in this region. As of 2014[update], the Italian national institute of statistics (ISTAT) estimated that 1,152,320 foreign-born immigrants live in Lombardy, equal to 11.7% of the total population. As of 2013[update], the gross domestic product (GDP) of Lombardy, equal to over €330 billion, accounts for about 20% of the total GDP of Italy. When this measure is considered by inhabitant, it results in a value of €33,066 per inhabitant, which is more than 25% higher than the national average of €25,729. The productivity of agriculture is enhanced by a well-developed use of fertilizers and the traditional abundance of water, boosted since the Middle Ages by the construction (partly designed by Leonardo da Vinci) of a wide net of irrigation systems. Lower plains are characterized by fodder crops, which are mowed up to eight times a year, cereals (rice, wheat and maize) and sugarbeet. Productions of the higher plains include cereals, vegetables, fruit trees and mulberries. The higher areas, up to the Prealps and Alps sectors of the north, produce fruit and wine. Cattle (with the highest density in Italy), pigs and sheep are raised. Palazzo Lombardia, seat of the Regional Council. Historically, the Christian Democrats maintained a large majority of the popular support and the control of the most important cities and provinces from the end of the Second World War to the early 1990s. The opposition Italian Communist Party was a considerable presence only in southern Lombardy and in the working class districts of Milan; their base however was increasingly eroded by the rival Italian Socialist Party, until eventually the Mani Pulite corruption scandal (which spread from Milan to the whole of Italy) wiped away the old political class and parties almost entirely. This, together with the general disaffection towards the central government (considered as wasting resources to balance the budgets of the chronically underdeveloped regions of Southern Italy), led to the sudden growth of the secessionist Northern League, particularly strong in mountain and rural areas. In the last twenty years, Lombardy stayed as a conservative stronghold, overwhelmingly voting for Silvio Berlusconi in all the six last general elections. Notwithstanding, the capital city of Milan landslide elected a new progressive mayor at the 2011 municipal elections and the 2013 regional elections saw a narrow victory for the center-right coalition. The youngest of the World Heritage sites is the Rhaetian Railway in the Albula / Bernina Landscapes, mostly located in the Swiss canton Graubünden but just extending over the border to serve Tirano. The site includes the Albula and the Bernina Railway and is listed because of the complex railway engineering (tunnels, viaducts and avalanche galleries) necessary to take the narrow-gauge railway across the main chain of the Alps. The two railway lines were opened in stages between 1904 and 1910. The auditorium of the Teatro Grande in Brescia. Apart from standardized Italian, Lombard is the local language of Lombardy. Lombard is a member of the Gallo-Italic group within the Romance languages. It is spoken natively in Northern Italy (most of Lombardy and some areas of neighbouring regions, notably the eastern side of Piedmont) and Southern Switzerland (Ticino and Graubünden). The two main varieties (Western Lombard language and Eastern Lombard language) show differences and are often, but not always, mutually comprehensible. The union of Western Lombard or Insubric, Eastern Lombard and intermediate varieties under the denomination of "Lombard" is a matter of debate, and it has been argued that the two might potentially form separate languages. ^ Partridge, Eric (2009). Origins : an etymological dictionary of modern English ([Paperback ed.] ed.). London: Routledge. ISBN 0415474337. 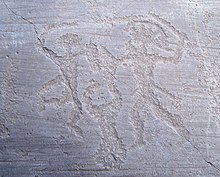 ^ "Rock Drawings in Valcamonica - UNESCO World Heritage Centre". Retrieved 29 June 2010. ^ "Introduzione all'arte rupestre della Valcamonica su Archeocamuni.it" (in Italian). Retrieved 11 May 2009. ^ a b c "Regional Statistical Yearbook 2014" (PDF). Regione Lombardia. Retrieved 21 July 2015. ^ OECD. "Competitive Cities in the Global Economy" (PDF). Retrieved 30 April 2009. ^ "RSY Lombardia-Arrivals and nights spent by guests in accommodation establishments, by type of resort and by type of establishment. Total accommodation establishments. Part III Tourist resort. Year 2013". asr-lombardia.it. Retrieved 31 May 2015. ^ "Ethnologue report for language code:lmo". Ethnologue.com. Retrieved 16 September 2011. ^ "The Global Language Monitor » Fashion". Languagemonitor.com. 20 July 2009. Retrieved 3 January 2010.